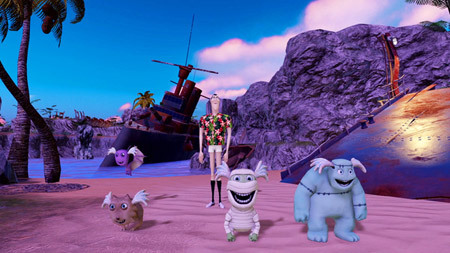 Hotel Transylvania 3: Monsters Overboard is an awesome adventure RPG developed by Torus Games. Dracula, Mavis and their monster friends are marooned on the mysterious Lost Islands, only you are in command of lovable little creatures and can save them. Explore the islands, discover new Impa abilities, and rescue Frankenstein, Murray and Wayne from fearsome enemies. A mysterious storm has washed the Drac-pack overboard and only you can save the missing monsters. Explore the legendary lost islands and collect secret treasure. Meet new friends and battle dangerous enemies. If you get stuck in the game, check out the video walkthrough and gameplay for the game. This entry was posted in PC Games, Walkthrough and tagged Hotel Transylvania 3: Monsters Overboard Bosses, Hotel Transylvania 3: Monsters Overboard Cheats, Hotel Transylvania 3: Monsters Overboard Cutscenes, Hotel Transylvania 3: Monsters Overboard Endings, Hotel Transylvania 3: Monsters Overboard Game, Hotel Transylvania 3: Monsters Overboard Gameplay, Hotel Transylvania 3: Monsters Overboard Guide, Hotel Transylvania 3: Monsters Overboard Hints, Hotel Transylvania 3: Monsters Overboard Review, Hotel Transylvania 3: Monsters Overboard Solutions, Hotel Transylvania 3: Monsters Overboard Strategy, Hotel Transylvania 3: Monsters Overboard Tips, Hotel Transylvania 3: Monsters Overboard Walkthrough by Marvin. Bookmark the permalink.